As the resident….well, I hesitate to use the term “junkie”, but it’s pretty much what the other two call me....“purchasing enthusiast” within the Polyhedron Collider walls, it seems that the majority of Kickstarters we collectively backed prior to 2018 sit squarely on my shoulders. Or perhaps I should say wallet. 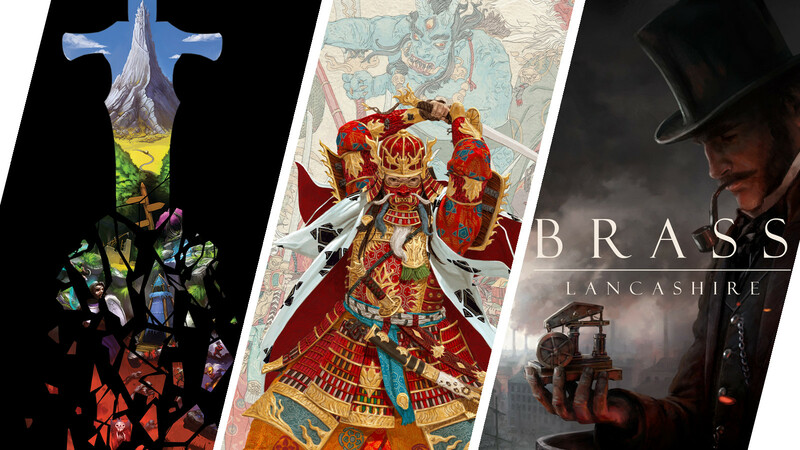 In this 2nd of three articles peering into 2018’s prospects like some kind of short sighted medium (you can read Part 1: Games coming to Kickstarter here), we’ll be looking at some of the games due to arrive on our collective doorsteps this year that had campaigns concluding in 2017, or before, which are due to arrive this year. Of course, as with every Kickstarter project there may be delays, so we live in eternal hope that projects run to plan. As a former Project Manager, I can categorically tell you that it is almost never the case, but we have to put our faith somewhere. I would put it in my football team, but they’re a bit pants at the moment so Kickstarter it is. Now, anyone familiar with Cavern Tavern should recognise the artwork in Final Frontier Games’ next title, Rise to Nobility. Set in the same universe as the very successful cocktail-based dice placement game (and incidentally, one of the first Kickstarters I ever backed), Rise to Nobility is set five years afterwards and chronicles the events surrounding the creation of a Council to broker and maintain peace between the races that populate the Five Realms. Your job in this dice placement game (I guess it’s good to stick to what you know, eh Final Frontier?) is to elevate yourself through the ranks to vie for the Chair of said council and run the show. I was a big fan of Cavern Tavern (Steve wasn’t enamoured with it, but what does he know) so I’m rather looking forward to what this new instalment has to offer. The Nico is doing the artwork again so it all looks very familiar. Rise to Nobility is scheduled for delivery in the first quarter of 2018, so watch this space for my thoughts on it. Whenever I write about this game, I keep typing Depp Madness. Whilst Deep Madness is oceanic-based, I’m sure Captain Jack has nothing to do with this game at all. What it does involve (beyond a frankly eye-watering Kickstarter all-in pledge from yours truly) is a survival horror affair at the bottom of the sea. I lovingly refer to the game as “underwater Cthulu” as it’s been “inspired by Lovecraft” according to the designers, Diemension Games. Given that one of the expansions (yes, I’m part of the problem) is called “Rise of Dagon”, I think the term “inspired” here is looser than Donald Trump’s understanding of global Climate Change. Either way, the game looks dark, dismal and very atmospheric and has an entire army of miniatures. Your job is to…well, basically survive all the gribblies (love that word) running about the base and find out what the Sam Heck is going on. If you’ve played Mansions of Madness, it should feel vaguely familiar, although mostly through theme not mechanics. Diemension Games haven’t made an app for this and the game flow is very different. The miniatures look lovely, the artwork is dark and it’s got Lovecraft in it. What’s not to like? Obviously I’m looking forward to this one, if nothing else than to justify the cost to my soul. And wallet. Quite some time ago (Expo 2016 to be exact), I played a game likened to one that ran on computers powered by steam and coal back when people thought Bananarama were good. I’d like to say things have moved on since then, but given the 18 month delay to the project, they didn't move very far very fast. H.O.P.E. is a space-based cooperative game not too dissimilar to Mass Effect. Work together to build support for a resistance to stop an encroaching force that is threatening to consume the galaxy. A bit like Disney. The rub here is that the board simulates a rather incredible 3D effect (hence the Q-Bert analogy) which you can use to your advantage. Depending on the angle you view the board, you can move via different axes, making the game a bit of a mind-bender to begin with. I’m told by the publishers that the game is on its way – so I may have it by the time you read these words. Technically not a new game in its own right, but an update of an original Martin Wallace game from aeons ago. Brass Lancashire is the updated original, but the lovely chaps and chapesses at Roxley have re-imagined the game and added their own flair to create the Birmingham edition too. Why they chose Birmingham, I have no idea. There’s plenty of other, much nicer cities to choose from. Like Scunthorpe or Bognor. It’s no secret that I like the drier games here at Polyhedron Collider, so Brass (not Brarss, Jon) was a bit of a no-brainer for me. Plus it’s extremely well priced at £40 per game complete with clay chips for money. Yes, it’s blinged to the max, but my goodness it looks lovely. Build your cotton business, keep up with demand for goods, ship iron and other materials to canals and trains and ultimately get the most VPs. It’s an economic game with a lot to think about and I for one am rather looking forward to it. Brass expects to be shipping in April 2018. After insisting to Jon several times that I’m absolutely not a miniatures game enthusiast, this is the second game on this list with a metric tonne of minis, so my protestation is getting more flimsy by the minute. Nevertheless, Lords of Hellas from Awaken Realms (of Nemesis and This War of Mine fame) is a scenario-based game involving building up your hero so they can (with the help of some hefty gods) beat seven bells out of your typical mythical monsters, control more territory or simply run your temple well. Get to the point where victory conditions are met and you’ll be the one who takes home the glory. The miniatures (although some of them aren’t that “mini”) look amazing and carry Awaken Realms touted “Sundrop” shading model. As far as I can tell it’s simply a dark wash and glaze applied via the medium of hosepipe, but it does make the base models look nicer than bare plastic. The downside is that if you want to paint them, you’ll probably need to strip them first and, whilst it may have been an oversight on my part, I couldn’t find a way to not have the effect at the pledge level I went for. Needless to say this wasn’t a cheap campaign either (or rather, I chose to make it not cheap because I’m weak) and is currently in Phase 1 shipping – it should be with us salivating backers very soon and indeed, some have already received their copies. Now if you’ve been listening to the podcast (and if you haven’t, please explain yourself) you’ll know that we’ve been looking forward to City of Kings since we saw it at Airecon in 2017. I say “saw it” – Frank West took the three of us through it and in his own unique style, Jon forced us to see more of it than we wanted. Not a reflection on the game at all, it was brilliant enough that two of us backed it (take a guess who) – this was more of a reflection of how the phrase “taking it slow” falls on deaf ears around the more diminutive member of the Collider Crew. City of Kings is a party-based dungeon crawler of sorts – although out in the open (go figure) where you’re part of a hardy bunch of heroes who intend to defend the titular City of Kings from a bunch of miscreants. The game scales as you go and there are literally thousands of bad guys thanks to a pseudo-random generation mechanic so you’ll hardly ever see exactly the same bad guy twice. The game ramps up quickly (as the erstwhile Mr Cage found out when he ran off to “explore”) forcing you to work as a team and level up your characters before taking on the bad guys. We’re all really keen on receiving this and have it on good authority that the game is on its way to us now. Needless to say, we’ll be reviewing this in the near future. Another podcast plug here, but we interviewed the esteemed James Hudson from Druid City Games some time way back in 2017 about his upcoming game, The Grimm Forest. The game is mostly centred around building houses as was the remit of the Three Little Pigs although with more encumbrance than just the Big Bad Wolf this time around. By gathering resources from the woods and surrounding areas, the pigs can build houses from wood, straw or bricks, but will encounter other characters from the fables along the way. I’m rather looking forward to this as not only do the components look cracking, but the idea of playing in the fairytale world with Snow White, Red Riding Hood and others all in the mix makes for a great setting to compete in a house building contest. Who’d have thought basic masonry could be so exciting? Grimm Forest is scheduled to ship in January so it should be wee wee weeing all the way to my home soon. Another one from Phalanx (they have been busy bunnies in 2017), Hannibal and Hamilcar is another remake hitting the shelves this year and has been around since UKGE 2016 when I first clapped eyes on its magnificence. A remake of the original Hannibal: Rome vs. Carthage, this 20th anniversary version is an upgrade of the original with miniatures, better components and a good excuse to bring tactical military action to the modern day. It’s a 2-player only game so it may have limited appeal, but when I played it during the demo, I fell in love. Hannibal is asymmetric as each player takes a side – Rome or Carthage – and tries to conquer the other’s territory. It’s not a “miniatures game” in the traditional sense, actually more of a card game – manoeuvre and out-manoeuvre your enemy so you control more of the lands and towns in your domain. Expand too fast and you’ll lose allegiance. Fail to expand at all and your empire will collapse faster than a meringue in a rainstorm. I’m a keen follower of Phalanx games and they’re currently running the UBOOT campaign and I’m ever-so excited to see this in the flesh. Phalanx are big fans of historic detail so this ought to be a belter. Hannibal and Hamilcar is due to ship around March to backers. Who remembers Bullfrog? If you’re a millennial, almost certainly not. If you were alive in the 1990s and played on the Amiga, you’ll know Syndicate – one of the best games ever made. The same folk went on to make Theme Hospital (after Theme Park) and it is here from where we begin to describe Dice Hospital. Whilst not being tongue in cheek, the artwork really reminded me of the 1990s classic game of hilarious ailments and whacky surgery. I got to see this at UKGE, not play it, just see it as the stand was mobbed. And with good reason – having seen some early versions of the gameplay, it looks and plays great and I can’t wait to begin the slaughter...er...I mean treatment of those lovely meatsacks. Dice Hospital is scheduled for shipment in August. For anyone around in the 1980s, the film The Thing should be engrained in your memory as a cult classic horror film about a bunch of idiots in Alaska locked in a shed with some weird goo that takes them over. There may have been more to it than that, but the salient point is that Who Goes There from Certifiable Studios is basically that film in board game form. Players begin as regular Joes but as time ticks on and temperatures drop, bad stuff happens and players aren’t always what they appear to be. The game is centred on paranoia and mistrust, so should prove popular with myself and “Backstab” Cage here. Can you trust your buddy (not if it’s Jon) or are they a slavering monstrosity seeking only to feast on your delicious quivering brain? Lock them in the incinerator and watch them burn (wow, that got dark) or keep them safe? Who knows...that’s the fun. This was a bit of a punt for me, but I’m getting more excited about it as time ticks on. Who Goes there is scheduled for a May delivery, but it’s looking like this will be delayed slightly. Our esteemed leader, one S. Tudor, wrote about Monster Lands some time ago when the game was hitting Kickstarter. Now, he sold the game to me as “we promised to get it reviewed, please can we play it. We can even get another mate involved”. Said mate dutifully complied and was put through the same ordeal as myself. Turns out, we actually loved it – probably obvious because it’s on this list, but indulge me. Monster Lands is a strategic dice placement game with a lot of push your luck chucked in. Players compete to grab heroes who seek glory and reputation and use them to slay terrific monsters and liberate lands (isn’t the title clever) in return for renown and piles of cash. Most cash and glory wins. Interestingly, we looked at both this and Clans of Caledonia at the same time and although we found a few issues with Monster Lands, we didn’t care because it was more fun. Monster Lands is scheduled for shipping in August. I can get my own back here and outsource this section to Steve as he's backed it. So if the quality isn't as high, you know why. Through some kind of miracle of manufacturing planning, CMON are actually going to be delivering their feudal Japan board game Rising Sun earlier than planned! (And there is a good chance you already have your copy.) 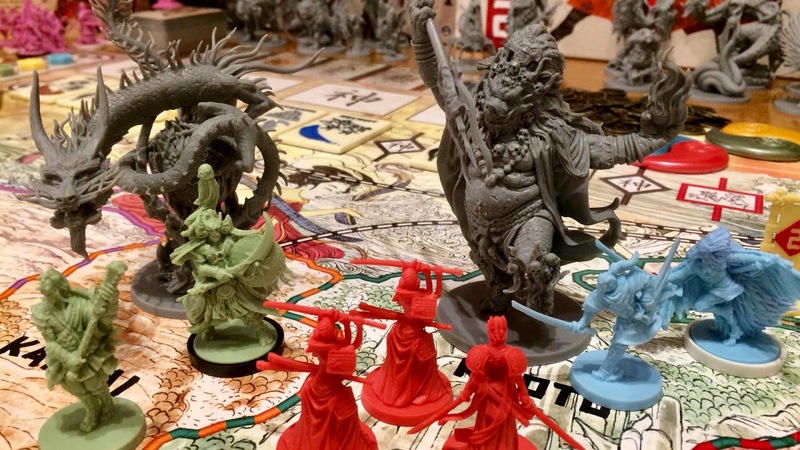 Designed by Eric Lang, and touted to be his spiritual sequel to BloodRage, Rising Sun will have you waging war and spreading influence, across the land. Via negotiation, bluffing, subterfuge and appeasing the spirit world, you will gain control of the board and oust your opponents. Along the way you will call upon a myriad of spirits, demons and New Zealand farmers to help you fight, assassinate and abduct your opponents. Central to the game is the honour system, which means that certain actions will raise or lower your status on the honour track and honour breaks all ties. Of course this game has got some amazing miniatures but the initial reports from versions that were released at Gen Con is that Rising Sun has the backbone of an amazing game to match. I must admit that I still run hot and cold on Blood Rage, but there is enough of a game there that I am quite looking forward to receiving my copy of Eric Lang's latest. So that's 12 games we are waiting by the front door in anticipation. We'll be back soon with Part 3 were we will look at the games coming to more conventional publishing means very soon. Don't forget to check out Part 1, where we looked at the games coming to Kickstarter.